FC PLATINUM finally remembered how to win yesterday when they dismissed Hwange in a tightly-contested Castle Lager Premiership soccer match at Maglas yesterday. A 77th minute penalty awarded to the hosts and converted by veteran midfielder Winston Mhango made all the difference. 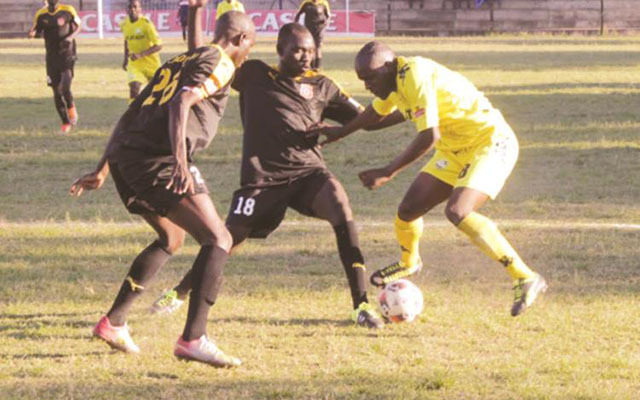 FC Platinum came into yesterday’s match having drawn three consecutive games. Coach Norman Mapeza’s charges drew away to Bulawayo City before settling for a home draw against Triangle. They later went on to lose two valuable points against Black Rhinos on Tuesday last week but yesterday they proved their critics wrong. The victory silenced some section of the home team’s fans who are against the coach and were planning to stage a demonstration on the newly-appointed Warriors gaffer. Mapeza and his team are now on second place and only a point separates them with Ngezi Platinum Stars although the Zvishavane-based team have a game in hand against Chicken Inn. Yesterday’s winning goal for FC Platinum came when Gift Mbweti, a former Hwange marksman who was giving the visitors a torrid time each time he was in possession, made his way through past Andrew Chuma. The defender had no option but to hack down the pencil slim midfielder and Harare-based referee Josia Masimira rightfully pointed to the spot. And Mhango, a penalty specialist for the miners, took the responsibility when his spot-kick shook the roof of the nets, sending the coalminers goalkeeper Taimon Mvula the wrong way. Hwange coach Nation Dube was not happy with the match officials and fumed after the match. “I did not lose the match to FC Platinum but I have lost it to the referee. I believe a draw was the fairest result. Otherwise I am happy with the performance of my boys as they played well and according to my instructions,” Dube said. But video evidence and pictures captured close to the scene clearly showed it was a penalty and even Chuma did not even dispute it. Hwange could have opened the scoring in the 36th minute when Nomore Chinyerere powered a stinger from a free-kick awarded outside the box but Petros Mhari was equal to the task when he went airborne to push the ball away for a corner. Agrippa Murimba, the hosts striker, was the next to miss when he was fed on the left by Elvis Moyo who had overlapped but the former Monomotapa and Mutare City forward failed to square the ball to Mbweti opting to shoot at goal but his effort was directed to the terraces. Raphael Muduviwa then overlapped on the right in the 47th minute and sent a cross that Rodwell Chinyengetere headed towards goal but his effort missed the target by some inches with the goalkeeper at the wrong side of the action. Mbweti, who has proved to be the live-wire for FC Platinum, gained possession in the 82nd minute, dribbled past Houlacks Kaunda and squared the ball that found no takers. It was a good performance by FC Platinum but still their strikers were found lacking where it matters most. They are creating chances but they are failing to put the ball into the back of the nets. Mapeza was happy for collecting the three points but admitted that the match was difficult. “It was a difficult match and my guys worked very hard for the victory. We need to stay focused but my main worry is that we are missing chances. “It is very difficult to get goals and you can see that most of the teams in the Premiership are winning by just a single goal. As FC Platinum we are creating chances but we are failing to score,” said Mapeza. FC Platinum’s next match will be against gold miners How Mine in a double header scheduled for Saturday in Bulawayo. FC Platinum: P. Mhari,R. Muduviwa, I. Nekati, E. Moyo, S. Shoko, W. Sitima, W. Mhango, T. Chawapiwa (H. Bakacheza 90th minute), R. Chinyengetere, A. Murimba (B. Amidu 65th minute), G. Takwara 89th minute ), G. Mbweti. Hwange: T. Mvula, A. Banda, N. Chinyerere (W. Munorwei 89th minute), H. Kaunda (C. Muleya 56th minute), G. Ndlovu, C. Phiri, A. Chuma, J. Kaunda, S. Gadzikwa, G. Zulu, M. Mpofu.